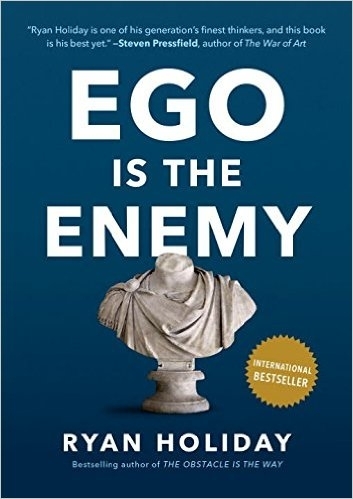 Better than Obstacle, it has some useful advice and good stories about how ego can lead to your downfall. It’s a tangent to stoic philosophy, so if you enjoy those concepts you’ll probably get something from this book. But stoicism is so easy to read anyway that there's not much point in reading this when you could read the originals. Ego in this context is an unhealthy belief in our own abilities, our arrogance and self centered ambition. The ability to accurately assess your skill is extremely valuable, and allowing your ego to inflate prevents you from having a realistic assessment of your abilities. Focusing on our talents and achievements blinds us to the work we still need to do. You can’t learn anything if you think you already know it. What am I not noticing that a more humble person might see? What am I avoiding or running from? Socrates’ wisdom lay in the fact that he knew next to nothing. Find ways to remind yourself of how little you know, read books on subjects you know nothing about, spend time with people who know much more than you. Anyone can learn from experience, the trick is to learn from other people’s experiences.